Lichen planus is an inflammatory skin condition that affects men, women, and children. It can be itchy, painful, and leave permanent scars. Doctors are unsure of the cause, admit it’s diffi cult to diagnose on nails, and offer few treatment options. 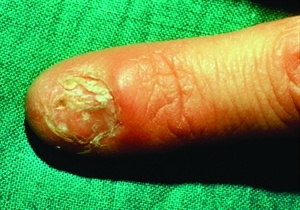 According to the American Academy of Dermatology, lichen planus affects about 1%-2% of the general population. There is little known as to the cause of the condition, but all theories include a reaction of the body’s immune system. The problem is doctors don’t know what causes the immune system to react. “There is no evidence of outside stimulus,” says Dr. Jere Mammino, D.O., a clinical dermatologist at Advanced Dermatology in Oviedo, Fla. “In a way, lichen planus is an auto-immune condition, because the immune system attacks the skin,” says Mammino. But even in this, lichen planus is an exception. “That term refers to genetic conditions such as rheumatoid arthritis or lupus,” he says.